I grew up on and around the water. My dad, Paul Heineken, is a windsurfer and sailor, and from a young age I began to follow in his footsteps. When I was 13, he and I began racing a 29er skiff together. In 2005, when I was 16 years old, Matt Noble and I finished 3rd in the 29er World Championship held at the StFYC. Matt and I then moved on to the next level high-performance skiff, the Olympic Class 49er. With the help of the Foundation, we competed in World Championships in Portugal and Australia, as well as the 2007-2008 US Olympic Trials, in which we finished fifth. 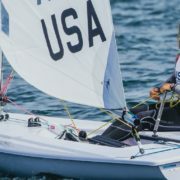 After that intensive year, it became clear that world level sailing in an Olympic Class and being a full time UCSB mechanical engineering student were incompatible, so I took a hiatus from 49er sailing, while I continued to captain the UCSB sailing team. In 2008, UCSB captured the Pacific Coast College Championship and I received All-PCC Team honors. But racing high-performance sailboats has always been a major part of my life, so once I was introduced to kiteboard course racing, I was hooked. Since then I have had continued success, winning the World Championship in 2011 and 2012, and finishing second out of 111 competitors in 2013. I have been honored with the 2012 Rolex Yachtsman of the Year award, and have been a finalist for the 2013 Rolex World Sailor of the Year award. The most sailing fun I’ve had this past year is learning how to ride a foil kiteboard. The StFYC sponsored the first ever North American Kite Foilboard regatta this fall on the Bay, which I won. My training video has received quite a bit of attention. In real life, I now work full-time as an engineer with Makani Power, a high-tech startup that was recently purchased by GoogleX. Makani is developing autonomous tethered flying vehicles (kites) to generate electric power. In addition, I work with Chip Wasson and Mike Zajicek on kite board development. 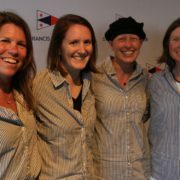 Thanks to the St Francis Sailing Foundation, I’ve been able to participate in a number of international events. 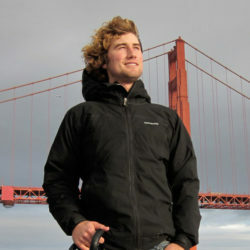 The Foundation has been crucial in helping me accomplish my sailing goals. I am very grateful.